Making this quilt feels a bit like giving birth. I've been at it about 7 months now. Each border takes more out of me than the last. Over the last three weeks, I finally finished up Border #5. There was lots of cursing, and a fair amount of heavy sighing...I even thought "what if I just end it here, no one even needs to know there's another border". But just like having a baby...there is no off ramp. You have to tough it out until the end. The good thing is, you know it will be worth it. and one with colored centers. 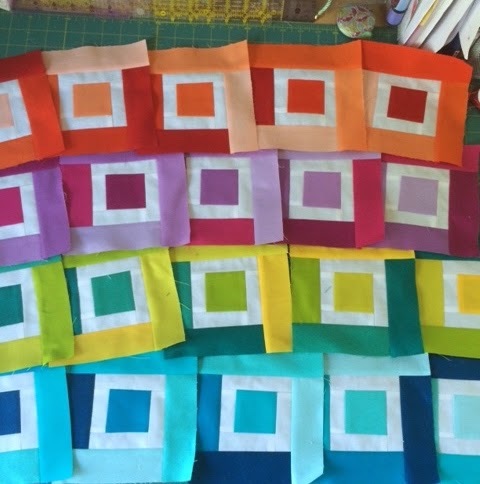 Amazingly enough, when I got the squares sewn together, they were actually the same length and width as the quilt, which qualifies as a small miracle. No creative stretching or trimming necessary. Every time my daughter sees me working on this she asks the same thing..."who's that quilt for???". And I give her the same answer every time, "It's for me. When I was your age in the 80's we had rainbows on everything, and these colors make me really happy." One more border to go. Gorgeous, gorgeous work! I've wanted to try this quilt for awhile now, but knew it would take forever (especially with so many other quilts in line before it! ).